Bitspeek is a real-time pitch-excited linear prediction codec effect. Right now you are probably thinking, "oh, another one of those"? Or perhaps not. Chances are that you have never heard about "linear prediction", although most of us use it daily when we talk on our cell phones. Linear prediction coding is a voice compression technology that appeared in commercial products in the seventies and was implemented in some well-known speaking toys of the early eighties. 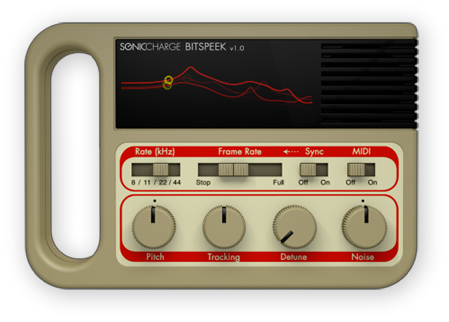 We have applied this technology to create a VST / AU effect plug-in that analyzes audio, extracts a number of parameters (including pitch, volume and formant data) and then resynthesizes the audio using a simple oscillator, noise and filter architecture. We have added a number of playback parameters that adjusts the pitch and tonal quality of the sound as well as support for MIDI and a beat-synchronized "formant freezing effect". Despite having only a few simple controls, this box can produce a broad range of sounds from cheap speaking toys to high-end vocoder and talkbox effects. For evaluation purposes you are allowed to try Bitspeek for up to three weeks. The trial begins the first time you open Bitspeek in your host sequencer. Bitspeek then only subtracts a week from the trial time if you actually used it that week. Purchasing Bitspeek allows you to use it fully and gives you free support and service upgrades. Registration keys are personal and are delivered by e-mail to the buyer after the order has been placed. 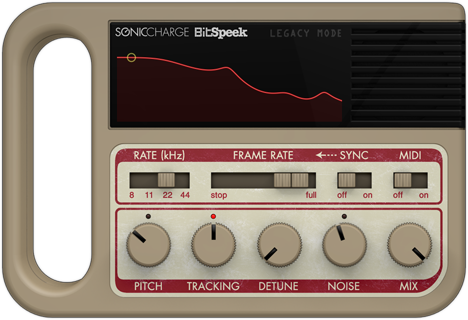 Save $86 on the Sonic Charge Plug-in Bundle, including Echobode, Permut8, Bitspeek, Synplant and Microtonic.